Flora Goodwin’s show is striking for a number of reasons. Firstly, the exhibition has no name - she states, ‘I feel strongly that I do not want to put these artists under one umbrella hence there is no title for the exhibition’. 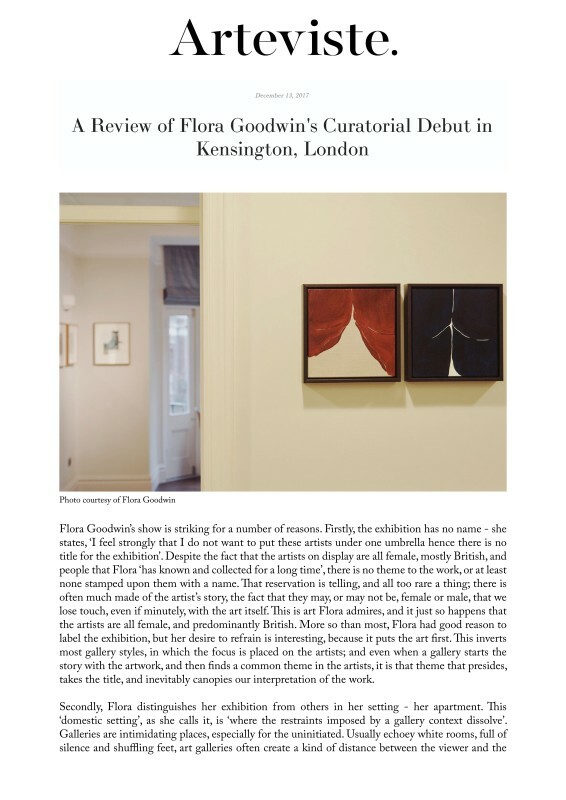 Despite the fact that the artists on display are all female, mostly British, and people that Flora ‘has known and collected for a long time’, there is no theme to the work, or at least none stamped upon them with a name. That reservation is telling, and all too rare a thing; there is often much made of the artist’s story, the fact that they may, or may not be, female or male, that we lose touch, even if minutely, with the art itself. This is art Flora admires, and it just so happens that the artists are all female, and predominantly British. More so than most, Flora had good reason to label the exhibition, but her desire to refrain is interesting, because it puts the art first. This inverts most gallery styles, in which the focus is placed on the artists; and even when a gallery starts the story with the artwork, and then finds a common theme in the artists, it is that theme that presides, takes the title, and inevitably canopies our interpretation of the work.